Being proud of spotting among the biggest hair export companies in the market, McSARA have known for our own super high quality products. We have been provides a vast quantity of best hair products to many customers all around the world. 20 inch weave wavy hair are being loved by its outstanding quality as well as our professional service systems. 20 inch weave hair extensions (weft hair extensions) black color are one of customers most favorite from MCSARA. They are made by sewing the hair in a weft in a sewing machine. 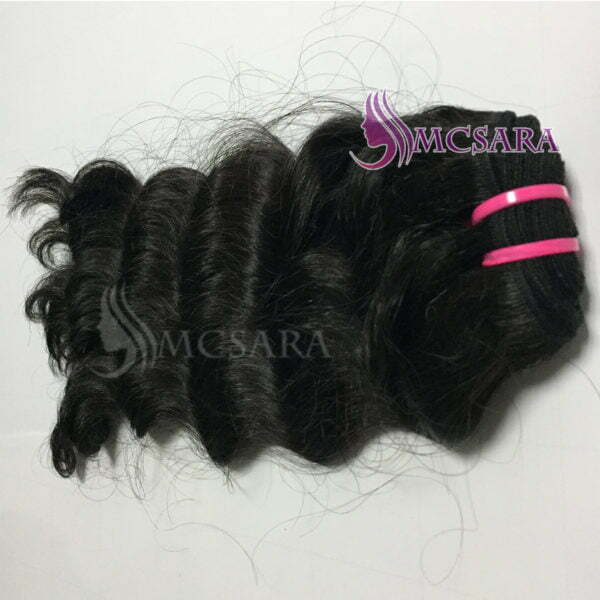 Weft hair extensions of MCSARA are sourced from 100% Vietnam remy hair. They are wholly natural as well as healthy for human uses with shedding-free and tangle-free. We create these hair extensions with a large quantity and super quality. Therefore, they are a good way to earn you a more wonderful yet stunning hair looks. Our weft hair extensions are natural made without any chemicals contained. We create many textures with weft hairs for customers own requirements. They are also in large boards of colors. Some of our clients’ favorite such as: weft curly hair extensions, weft wavy hair extensions or other shade of colors as black color weft hair, brown color weft hair and so on. Weft hair extensions will be your new stairways that lead to endless fabulous hairstyles land. With MCSARA weft hair extensions, you will have many free choices of hair length. Our hair products are ready in 6 inch to 32 inch weave hair extensions. Trying fashion bob or flowing silky long hair styles are all possible options when using our hair extensions. Being natural human weft hair extensions, our hair products are shinning soft with flowing silk-like appearance. As the trend setting, machine weft hair extensions are many girls first option when wanting a young-looking. At the same time these hairs are an awesome to protect your hair when you are still can wear on numerous hairstyles. Your natural hair will get a better treats without any harm.